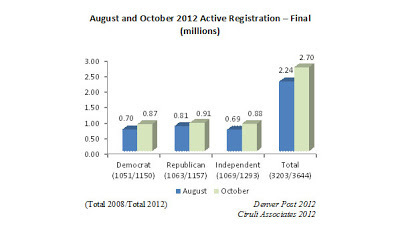 Democrats reduced the August vote gap in voter registration from 110,000 to 70,000 as registration closed in early October. More than 260,000 people registered or reactivated to vote. There are 3.560 million registered voters, both active and inactive, which is a new record and exceeds the 2008 total registration by 330,000. In 2008, the year of Barack Obama’s huge win in Colorado, Republicans exceeded Democratic registration by 12,000 active voters. In the big Republican year of 2010, they had a 113,000-vote advantage in Colorado. Their current 70,000-vote advantage in active voters leaves their base vote between the terrible 2008 election and the much more successful 2010. Among total voters, the largest group today is unaffiliated voters, who exceed the two partisan camps. 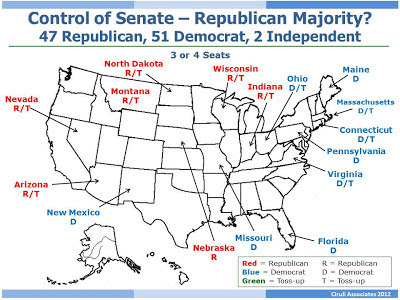 They were also the largest bloc in 2008. Unaffiliated voters tend to vote at a lower rate than partisans. Mike Coffman received the Denver Post’s editorial endorsement (Oct. 14) in spite of the Post’s belief he’s too conservative for the newly redesigned district. Basically, they like his willingness to break with the Republican budget position on cutting military spending. Joe Miklosi, a local politician with no previous leadership profile in the Democratic Party, benefits from the newly designed district, which Barack Obama won in 2008 as did Senator Michael Bennet in his razor-tight 2010 re-election. Miklosi is also receiving significant funding help from national Democrats in their quest to win a net increase of 25 seats and regain control of the House. The DCCC is also developing and airing its own (highly standardized) advertising spots to help Miklosi. Finally, he benefits from the powerful Obama ground game working to get out the vote in Aurora and Arapahoe County. The election morning photo op of the candidate and wife voting to encourage turnout is over. 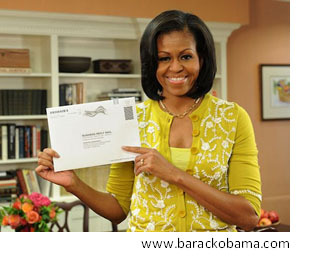 Michelle and Barack Obama voted absentee in Illinois to encourage early voting, which they hope to win. More than 70 percent of the national vote will be early. Precincts on Election Day see few voters. By Friday of this week, a quarter of Colorado’s vote will be in the local clerk’s offices around the state. 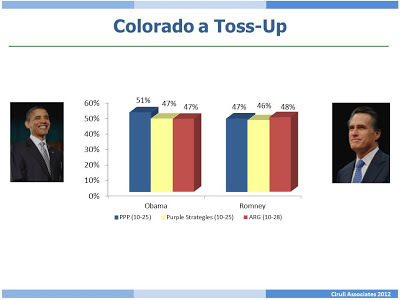 The Denver Post released their latest poll (automated) that confirms a recent series of polls showing Mitt Romney breaking into the lead in Colorado (Oct. 10 blog). 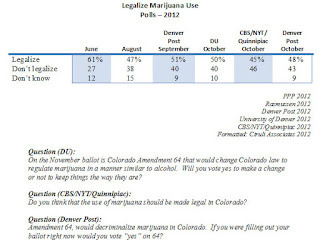 Colorado is tracking the national trend that moved to Romney’s favor for the first time October 9, six days after the first debate. Although, the national trend as of Monday, October 15, now shows a tie race, possibly indicating the debate bounce has begun to smooth out. 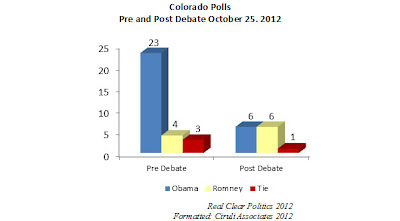 The Denver Post poll showed 12 percent of voters say they switched candidates after the first debate: 34 percent went to Romney and 16 percent to Barack Obama. Romney also gained twice as many undecided as Obama. Joe Biden did his job. Democrats were relieved to see him fight after the listless performance of the President. They have been re-energized for the final three weeks and are anticipating what they hope will be a Barack Obama comeback debate on Tuesday night. Democrats were also delighted to have Biden hit the Republicans with specific arguments over “47%,” Medicaid, taxes and abortion. Biden did all Democrats could have hoped for. Paul Ryan held his own in the face of the Biden onslaught and, in fact, won some points, especially on style. Ryan’s calm demeanor was a sharp contrast to Biden, who became so animated that it appeared in debate prep his advisors may have let a little too much slack into the performance. About 15 minutes into the debate, Biden’s grins, grimaces, groans and interruptions became a distraction. But, he had a good close, and Democrats sprinted into the spin room, a sharp contrast from the funeral march after the Obama debate. Now, we will wait for data and prepare for the presidential town hall debate at Hofstra University in Hempstead, New York. 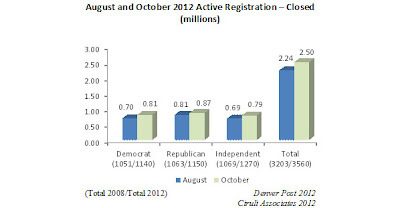 Denver TV has received millions of dollars of TV advertising from the presidential campaigns and associated PACs. 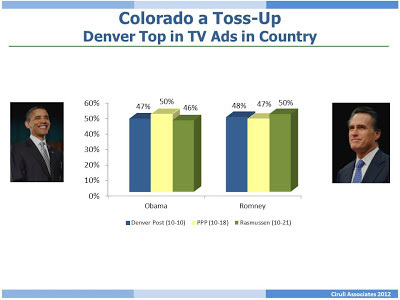 The latest report states Denver is the number one city in the nation for political ads during September with 7,770 – Barrack Obama had 4,791 and Mitt Romney 2,979. Beginning October 8, Romney finally exceeded for the first time this year Obama’s massive dominance in television advertising purchases. More good news for Denver stations. Vice Presidential Debate – Helps or Hurts New Frontrunner? 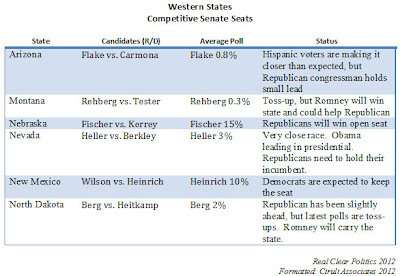 Fresh from surging to the lead, Mitt Romney’s new momentum gets a test on Thursday in the vice presidential debate. As posted a few days ago, a group of Belgium journalists stopped in for a briefing on the election and the debate. The following is one journalist’s questions on the VP debate and my responses. Q: What are the main challenges of this vice-presidential debate? Along with the personal challenge to be seen as competent and hopefully a winner, each side carries the campaign banner. There will be more interest in this debate because of the attention generated from the first debate and its apparent impact on the race. Q: Is it also less about “substance” than “appearance”? There is always a blend of substance and appearance. But, as the first debate showed, tone, style and forcefulness count at least as much as having facts. But, Romney’s having a plan, his five points was a benefit. He looked prepared and ready to work for jobs. 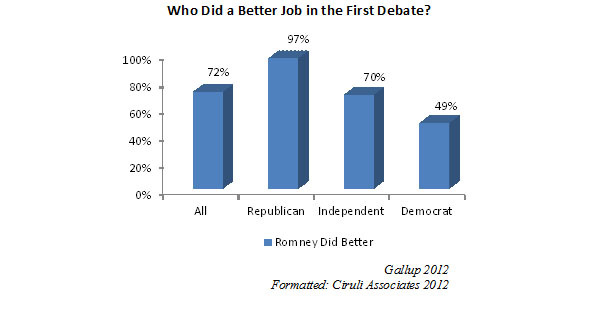 Q: Is it possible for Biden to overcome the results of the first debate, which was favorable to Romney? There will be pressure on Biden to at least make a good, gaff-free show of it. Vice president debates seldom become important enough to change a race. Biden would like to stop the current news cycle narrative of Democrats in trouble. Ryan will also be under pressure to hold onto the momentum and not let his views or plan become a liability. Democrats have been attacking the plan for months. Ryan, as the new person, has an opportunity to become a national figure, but also the possibility of becoming a distraction just when Romney is making progress. Q: Next presidential debate will be a “town hall” meeting. What difference does it make? The next presidential debate will make it more difficult for the candidates to argue with each other, such as during the long rebuttals in the first debate. 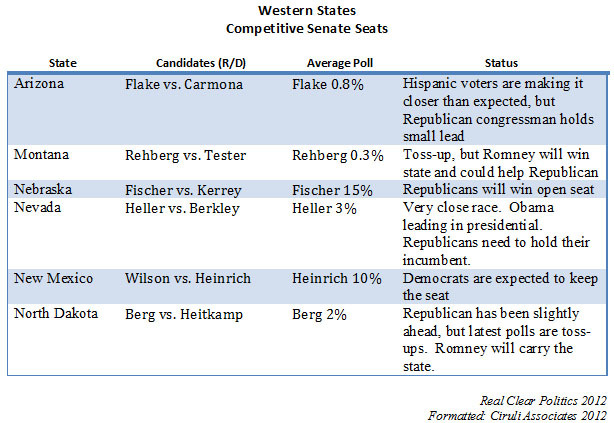 Romney can expect many social issue questions that tend to benefit the Democrats (i.e., abortion, immigration). Candidates will need to be more conversational and focus on the citizen questioners. Even 49 percent of Democrats thought he won, along with 70 percent of the all-important independents. But, most importantly, it’s a game changer for the respective bases of each party. I addressed two Republican-leaning business groups Thursday, and the change in their mood was palpable. Democrats were equally affected, and while the initial emotions were disbelief and denial, the base snapped to attention to realize that there is still a contested election. The best known political aggregator website, RealClearPolitics.com, maintains the most respected and frequently used polling averages. 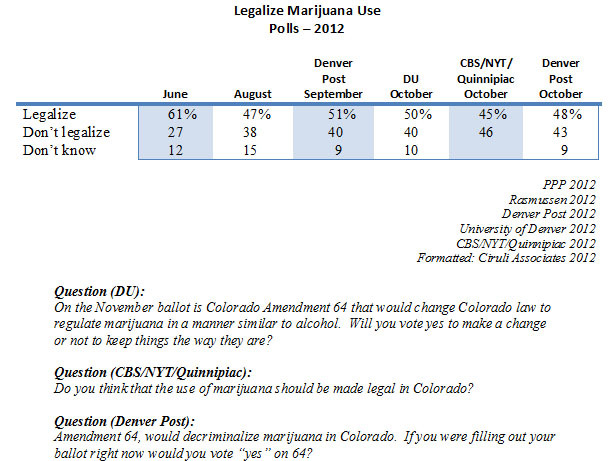 It lists 34 polls conducted in Colorado since February on the presidential race horse question. 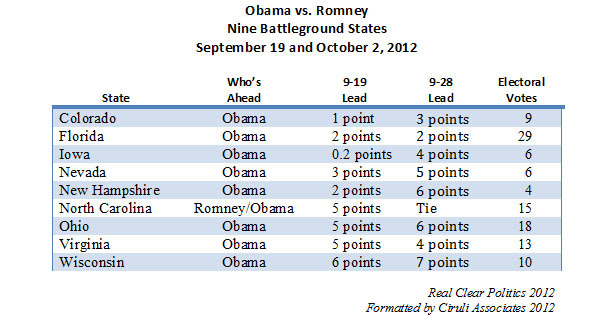 Mitt Romney has only been ahead six times, but three have been in the last week. 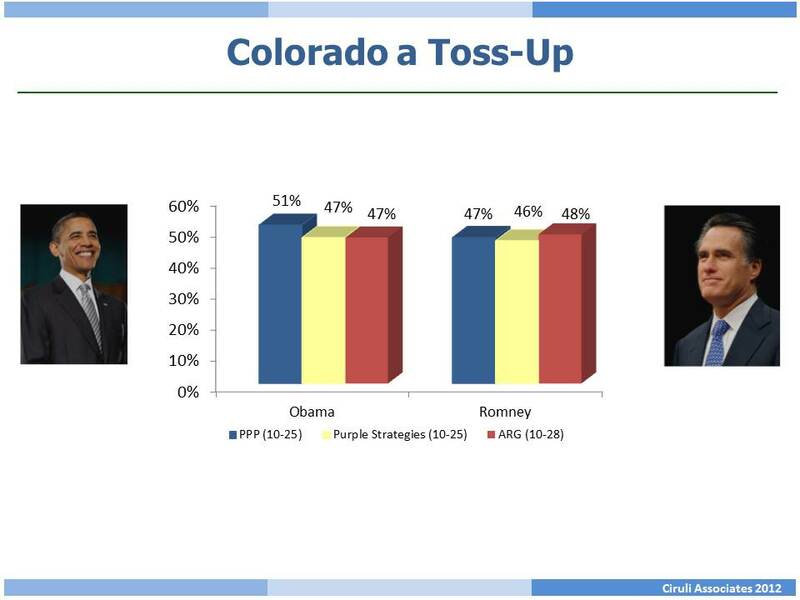 Because of that, Romney is now ahead in Colorado by a fraction (0.5) of a point over Barack Obama for the first time this year. Obama has also lost his national lead six days after his weak debate performance in Denver. As Ron Brownstein wrote in the October 4 National Journal, the debate did two important things for challenger. In the NBC Nightly News on October 3rd debate night, Brian Williams aired a Tom Brokaw produced piece from Colorado on undecided voters. I opined on independent voters’ concerns and what they will look for in the debate. The debate was mostly an aggressive exchange on the economy, but in terms of getting something done, both candidates made only brief statements about their experiences and successes reaching across the isle. Two strong winners from last Wednesday’s presidential debate were DU and the remaining debates. Seventy million people watched the debate and millions more streamed it. Although the debate format was controversial, it accomplished its purpose. Expect large audiences for the next three debates. I recently spoke to a group of eight Belgium journalists about the election. One followed up with post-debate e-mail questions concerning the effect of the debate. Q: Your take? Do you agree with most of the pundits/commentaries that President Obama lost the debate, and why? A: Mitt Romney won due to having lower expectations and exceeding them. People thought he would lose. Debates are mostly about looks, tone and presence. Romney was confident and in control of the stage. He was forceful, but not too aggressive. He addressed his negatives (mentioned the middle class repeatedly, defended his tax plan and challenged Obama on his). Obama was not energized and missed many opportunities. Q: What will be the impact on the campaign(s)? 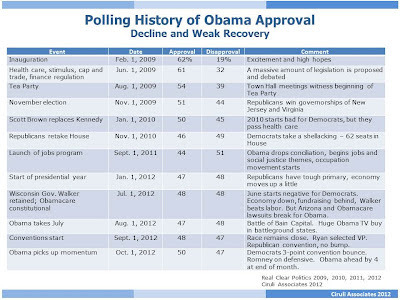 In your view, what should the Obama campaign do to re-bounce and get grip again? Could this “bad” performance have a silver lining; a.k.a., to fire up grassroots to GOTV and avoid complacency? A: The impact is not clear, but it stopped the views of commentators that the race is over. It provided Romney room to go on the offensive. But, it’s late and many people have decided and some are voting. Also, Obama commentary and spin analysts are deconstructing the debate to help Obama make up some ground. Obama will stay aggressive and busy until the next debate and be better prepared for it. The Republican base will be the most fired up, but Obama partisans will feel more urgency. Q: Do you think Mitt Romney has washed away negative perceptions since “47 percent” incident with his stronger performance? In your view, how do you see his campaign evolve? A: Obama missed an opportunity with the “47%,” but has it in his advertising. He can use it in the town hall debate, but Romney has at least made the case he is concerned about the middle class. The town hall debate will likely bring up social issues, which benefits Obama. Romney now has a chance to use the next two debates to keep the race close. His debate performance would make a good commercial. In spite of a slow recovery and a poor national image from labor strikes and weak performance, local Colorado school districts are feeling confident enough to ask for a billion dollars of new revenue. Denver has the largest request for a $466 million capital program and a $49 million annual override. 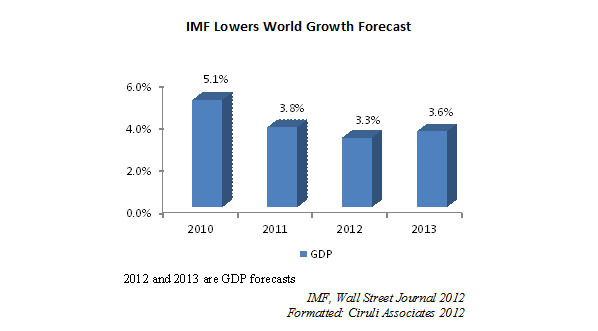 It argues that growth and deteriorated facilities require the expansions and upgrades. They cite a need to replace lost state funding as justifying the revenue increases. Denver fights, and often wins, a regular battle to reform its program against the forces of the status quo. A divided board vote on the package signaled that the difference of opinion over reform is likely to affect the bond and override election. More than 20 districts have requests. Pueblo County tried last year and was defeated. Recent years has not been supportive of tax and school funding increases, but some districts feel local support will overcome macro issues of the weak economy or national public education’s poor image. And, most importantly, political observers from both parties believe that Mitt Romney needs this debate to stop Barack Obama’s apparent momentum. Romney must reframe the final conversation with voters and go on the offensive the last five weeks. Romney’s task is urgent. Early voting has already started in Iowa and Ohio. He had a difficult September facing a Democratic convention bounce and attacks from the off-the-record fundraising “47 percent” comments. Debates are mostly about tone, look and communicating personality, not presenting 5 or 10 point plans. Romney will need to show his self-confidence, demonstrate policy competence and communicate compassion while aggressively reminding voters of the President’s failures and reasons to vote for him – not an easy blend in a debate. But, October 3rd will be his biggest audience since the convention and a critical moment to change the dynamics of the race. History suggests debates seldom help candidates, but they can hurt. And, Obama must avoid a misstatement or bad appearance that could change what looks like a building lead. Obama will try to keep Romney off-balance, without looking defensive or hostile. His goal is to reassure voters who believe he’s going to win and are leaning to him that he’s the right choice. 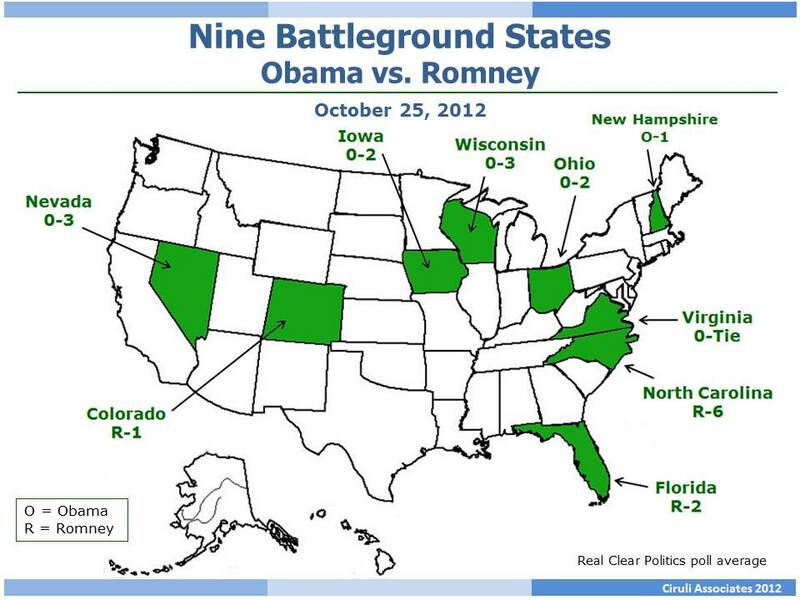 The Obama campaign strategy of targeting states has worked. 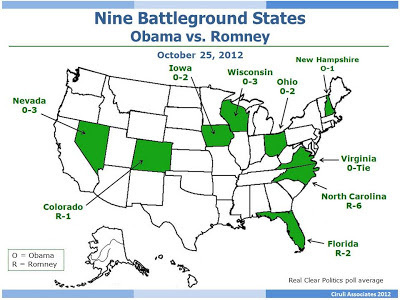 As reported on this blog on September 20, Barack Obama is still winning 8 of the 9 toss-up identified states. North Carolina is a tie. On the 20th, he was losing in North Carolina. 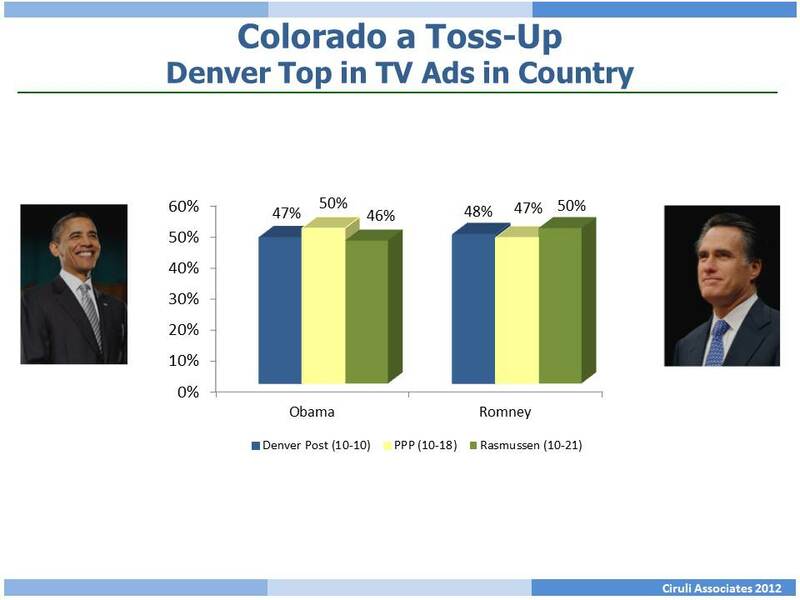 Obama began visits and massive advertising early in Colorado, and he now leads Mitt Romney by an average of three points. 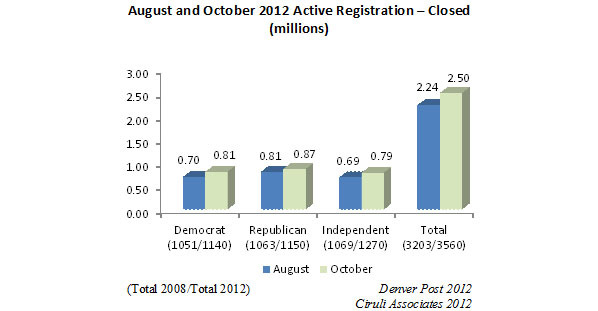 As of September 21, Obama had been in Colorado campaigning ten times this year – a record number for any president. Obama’s advertising started shortly after Romney became the presumptive nominee and was strongly negative. A couple of recent reports highlight the significant Obama media spending. A CU student’s analysis of ads purchased from July 30 to November 6 rank Denver the third biggest purchase in the nation this year. Obama booked $4.6 million and Romney $1.4 million. NBC News reports since March 19, Colorado was one of the few states Obama’s expenditures exceeded Romney’s: Obama $20 million, Romney $9 million; direct campaign spending total PAC and candidate spending: Obama $28.5 million, Romney $26.5 million. Looking at the electoral map, if Obama takes all the states Democrats regularly win (and current polls show substantial leads), he will have 237 electoral votes toward the needed 270. Romney will have 191 by that criterion. If Obama takes the eight toss-up states he currently leads, he would pick up 95 out of the 110 electoral votes in the toss-up list. 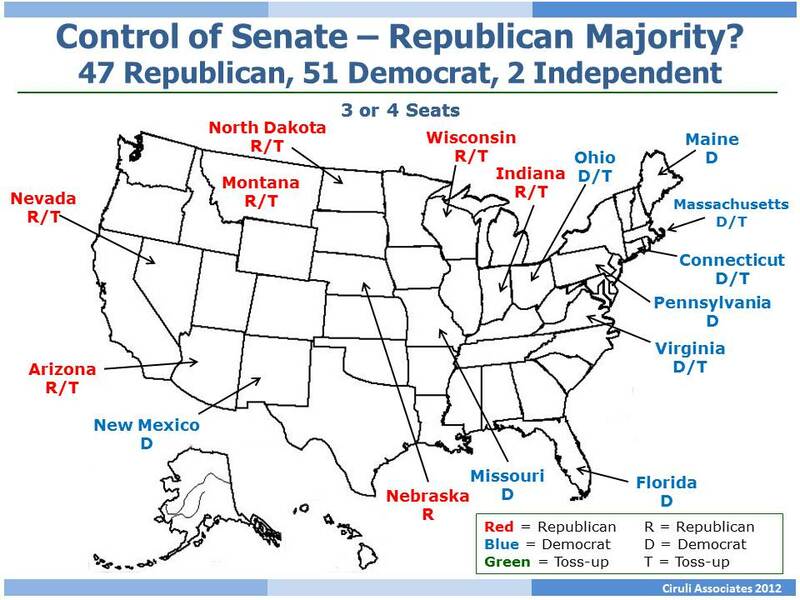 Obama would win with 332 electoral votes – down from his 365 in 2008, but still a 33-vote cushion. After hitting a low of 44 percent approval a year ago, Barack Obama has slowly recovered to 50 percent – the historic re-election threshold. Obama began at 62 percent on February 1, 2009 immediately after his inauguration, but dropped steadily to 46 percent in the 2010 “shellacking” November elections. The summer of 2011 was even worse for the administration. The debt ceiling crisis made them look disorganized and Obama weak. But, in the fall of 2011, the administration repositioned itself as the campaign took over and the themes of social justice and jobs came to shape the messages and actions of the administration. In December 2011, it was Republicans in Congress who looked weak in the conflict over unemployment extension. 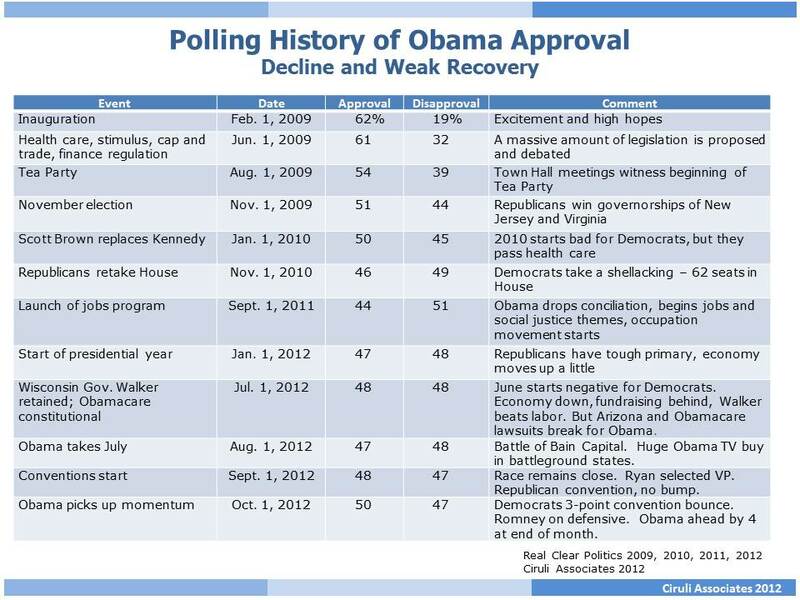 Observation: Looking at Obama’s approval trend, it appears he’s done better as a candidate than a president. Denver Debate: Romney’s Last Chance? The Denver presidential debate may be Mitt Romney’s last chance to get his campaign on track. He’s behind nationally by four points and losing most battleground states. Colorado voters, in particular, will be watching the debate. Normally, debates only reinforce already established voters’ dispositions, but Romney needs voters to give him a fresh look and a second chance to make his case. There are a few instances where voters have used debate performances to make up their minds. Probably the example Republicans like to cite is the 1980 Reagan vs. Carter debate. Reagan used his well-remembered “there he goes again” line to highlight Carter’s repetition of straw man arguments and his scolding voice. But, Reagan’s close has become a piece of American presidential lore. “Are you better off today than four years ago?” framed the debate and the election for still deciding voters and started a landslide. Reagan had been down in the polls going into the debate.